It's that time of year again. Maybe our favorite time of year, actually. We'll be in booth 1137 at IAEE's Expo! Expo! next month with our latest and greatest. It was New Year’s Eve on Bourbon Street. I was fresh out of college and enjoying time in what seemed like a foreign land with thousands of fellow NCAA football fans. The streets were lined, shoulder to shoulder, as far as the eye could see. You could literally pick your feet up off the ground and be whisked away in whatever direction the surrounding mob was headed. It was equal parts frightening and awesome. Those same two feelings could also describe my initial Expo! Expo! experience some 5 or 6 years ago. The good news: I don’t anticipate much anxiety this time as I head to Expo! Expo! in New Orleans next month. We’re excited to once again exhibit at the industry’s premier event for trade shows. In booth 1137 this year, we’ll have a bar, several fun yet useful giveaways, and as many product demonstrations and tech discussions as your little heart desires. 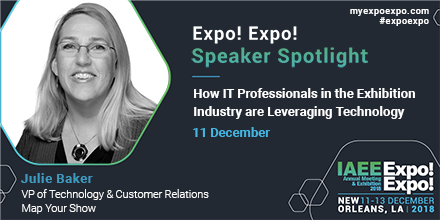 If you don’t have time to see us on the exhibit floor (shame on you), you can also find someone from MYS at a session our very own Julie Baker is participating in: How IT Professionals in the Exhibition Industry are Leveraging Technology – Tues, Dec 11 at 9:00am in Room 353. We’ll also be dispersed throughout the IAEE Chapter Receptions (namely DC, Mid-South and Texas, among others) on Tuesday at 5:30pm. And, of course, you can probably find me on the dance floor at Humanity Rocks come that Wednesday night. I’m on Twitter, too, in case you want to reach out to choreograph a dance ahead of time.